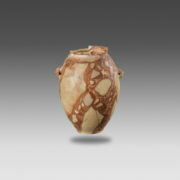 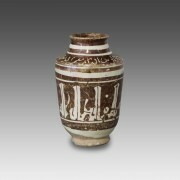 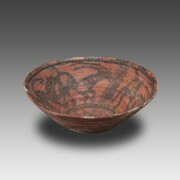 The regular shape of the vessel seems to indicate that it would have first been hand-made and then turned on a wheel. 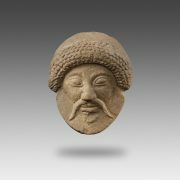 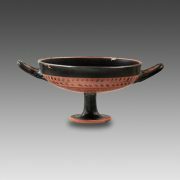 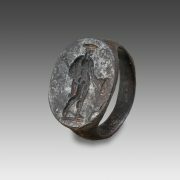 The blackish gray terracotta is covered with a black paint, whose lustrous appearance was achieved by diligent burnishing. 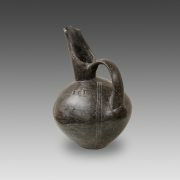 This cup, slightly smaller than the average size, is remarkable both for its technical and aesthetic qualities, which refer to the great tradition of Attic pottery in the 6th century B.C. 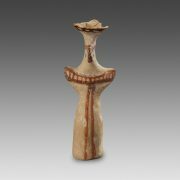 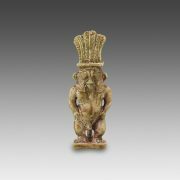 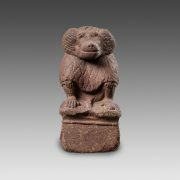 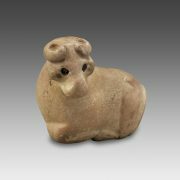 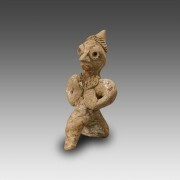 Like almost all Syrian terracotta statuettes dated to this period, this figurine was hand-modeled in a very stylized, almost instinctive manner; it is seated on a simplified stool.